Did you know there is a homeless man in Selinsgrove? Walter Keister sleeps in a tent that he carries as he walks back and forth from Lewisburg to Selinsgrove. “Medical issues ruined my life,” Keister told the Orange Street News. Selinsgrove Mayor Jeff Reed told the News he was aware of Keister but wasn’t sure what could be done. “I’ve seen him walking around for quite some time,” Reed told the News. Keister told the News that his back hurt from carrying the bag but refused to say why he was walking around all the time. When asked where he was going next Keister told the News he did not know. “I don’t have a destination,” Keister told the News. Walter used to live near me in Lewisburg and he lived in a tent outside his family home. Walter helped me out on several occasions and heard much of his story. Walter is a very intelligent and caring man who just got to a point where he just had had enough. He has been living out on his own for several years now and I do see him on occasion as he ventures in to town for food and supplies. How can I order this newspaper? Ive actually spoken to this guy, He takes no charity…. When i was young my parents tried to give him money and he turned it away. He is very mysterious… He has been doing this for at least 20 years. I remmeber seeing him walking route 15 at 12 years old. As I understand it, this unfortunate homeless man is the only homeless person in your community. (I’m not from your area, so I don’t know anything about Lewisburg.) Selinsgrove Mayor Jeff Reed has been aware of this gentleman’s situation for quite some time and can not solve or improve the situation of the only homeless person in his town. Turning a blind eye and hoping this man simply goes away should be an embarrassment to this Mayor’s record. I know your concerns are genuine, but please know that Walter’s travels are not the mayor’s fault. I have known Walter for many years. He is very kind and a veteran. Many, many friends and local officials and agencies in his hometown area as well as ares to which he travels have offered assistance, housing, and whatever else Walter needs. He will not accept more than nominal help and does not want to stay in one place. He is living the life he wants and enjoys. In our state, one cannot be forced against their will into “a place” unless they are causing harm to others or themselves. As long as Walter can travel, he will and when he can no longer do so, there will be many willing to help him. We pray for him often that he will soon choose a warm apt. In the winter. Just know that he has never been ignored by either local citizens or strangers that offer him a meal or a ride. He is kind and caring for others. He refuses help he chooses this life. Weve talked to him many times. It’s not the mayor’s fault. This man does not believe he is homless. There are some homeless people tyhat don’t want permanent homes. Every time I see him he has a smile and is happy, don’t judge someone else’s life by your standard of living. There are plenty of folks who would help him if he truly wanted help, but he is content just walking, working odd jobs and such. You have never met the man, you admit you don’t live in our area stop passing judgement on something you have no connection to and or barely know about. He doesn’t want help or hand outs he chooses to live this way many have asked him this . This is his choice. He lived in the yard of his parents house for a long time. The community has not turned their back. At this point they watch, but respect his wishes. Some homeless people choose to be homeless.There mental illness dictates their every move. There have been many people who wanted to help this man but he refused. If the Mayor didn’t turn “a blind eye”, as you stated, this man would be in jail…You can’t just camp on other people’s property. Seems to me He is letting this man live his life the way he wants to live. Sad but very true. Several churches in the area have offered help, but he has refused it. It’s not just the mayor. You lead a horse to water but you can’t make him drink it. If people think he us the ONLY homeless person in our area they are very wrong. This man is living life on his terms and happy about it. Help is here for him if he ever needs it. Better than the lazy members who only know how to stand there with their hand out for freebies. This gentleman was kind enough to donate to my daughter’s softball team during a fundraiser. The girls told him to keep his money for himself but he refused. He taught the girls a very valuable lesson that day. I’ve been watching him walk the highway for quite a few years now. Always wondered what his story was. Just by coincidence I was standing beside him tonight in the bread aisle at Walmart. My curiosities about him almost got the best of me, as I almost struck up a nosy conversation about his situation. Not wanting to bother him or make him uncomfortable, I just let him be. Thank you for this article and for shining some light on this man’s story. Homeless? Walt is FREE! And free by choice. God bless you Walt. Habitat for humanity needs to be on this. 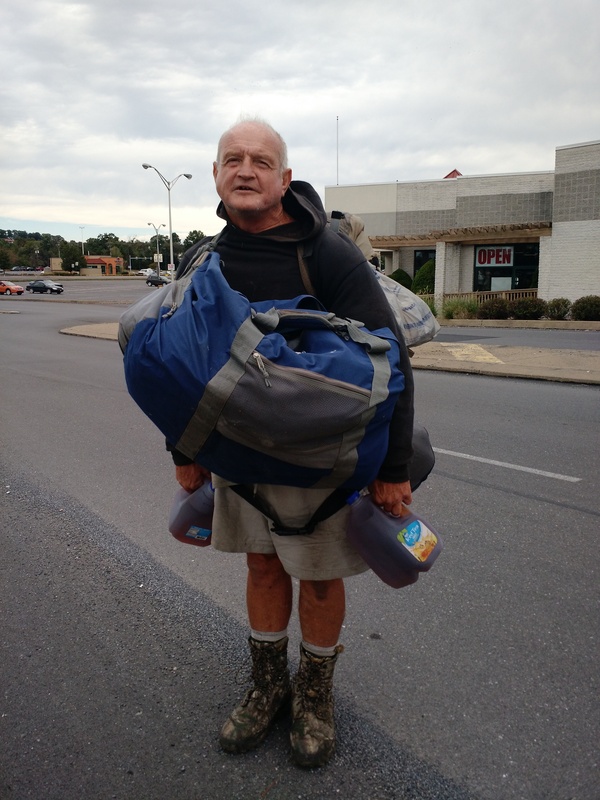 He isnt the only homeless person in PA… or the nation for that matter. Honestly you guys are ignorant for making an article and blasting his name. Whether he chooses to or not you don’t blast somebody like that. I have seen him lay too close to the road or in on ramps, that concerns me. When I see him walking along the highways on those hot summer days I always think that what he thinks he’s doing. He’s 68 years young and the amount of heavy gear he carries and gallon jug of drink. The shape he must be in. Very nice guy. I always thought he to be very level headed and be in complete control. I hope you took the time to sit down to have a meal with him. He is one of the kindest man I have ever met. As we sat in the ditch at Sheetz eating Kentucky Friend Chicken, he reminded me that No one will every get any where without God in there life. What he is doing is exactly what he wants to do. I am so thankful for all the nice people who take the time to talk to him..He loves talking to people. This man is a Veteran. He is very nice. I’ve had several conversations with him and bought him food and gave him some money. I asked him if I could pay for a hotel room for him for a few nights to get out of the cold and he would not accept it. He explained he likes living free. God bless him as he will only accept very little. He is a kind soul. His father was an art teacher for the Lewisburg school systems. they lived in downtown Lewisburg. my father and him were friends growing up, my dad is a few years older than Walter. Dad said that Walter is a very upstanding man, and the whole town knew him. When he came back from the war he needed to be free. if you look, Walter is always smiling, he may not have a destination, but he knows where he’s going. God walks beside him and carries him when he needs it. I worked with Walt years ago in a grocery store on 3rd shift. He worked the frozen aisle. Good worker, real nice guy. I did hear he was a veteran of the Vietnam War and knew he would walk far distances and live outside. I knew of him as a religious man. I still see him from time to time at the grocery store. I think ,like others have said, he just wants to do his thing and be left alone. I can’t imagine how good of shape he must be in to be carrying that huge backpack all day, especially at age 68! I must say in life you are granted gifts,Tonight Walt was lying in a parking space on a side street in Lewisburg,something din”t seem right,we turned around and pulled over to check on him.Walt was lying down with his head on his back pack.Never introducing ourselves we got him loaded up in the car and took him to one of his earthy homes.I must say it was an honor to finally talk to this man.Twenty plus yrs. I have seen him in Lewisburg,and as far as twenty-five miles + from here.hour,almost two later we said good night,shook his hand and went on our way down the road.Not feeling good folks,PRAY!! so much knowledge,HUMBLE,SOMETHING PEOPLE HAVE LOST.It felt like we were with him for several hrs.He did not ask for anything,we took him were he needed to be.Tonight was a true gift,we were very moved,as he was to.The conversation we had with him is deep in our soul’s.Driving away his inpact and our conversation was very moving,then to look at the sky and see a falling star….Thank you mother earth for comforting this man,to the higher power and footstep’s of determination.Thank You Walt Keister,it is an HONOR!! This entry was posted on September 25, 2015 by Hilde Kate Lysiak and tagged Hilde kate lysiak, homeless, Orange Street News, selinsgrove.